You girls are the color of Autumn. We hope you can get back to your naps now. You two girls epitomize Autumn and especially in this photo. How sweet and adorable, but you two are always that! You both look beautiful on that fabric. You have lovely autumn colours. I have other girlcatfriends, but if you don't mind that, I will be happy to be your sweetie too. What a wonderfully adventuresome time of year. 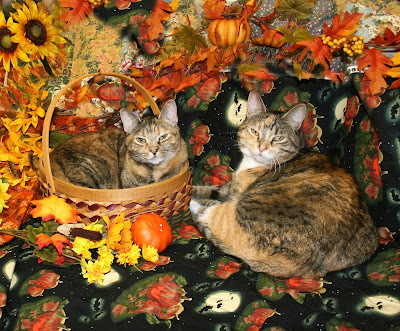 You two almost blend in with that fabric great job being sleuths, beautiful work. 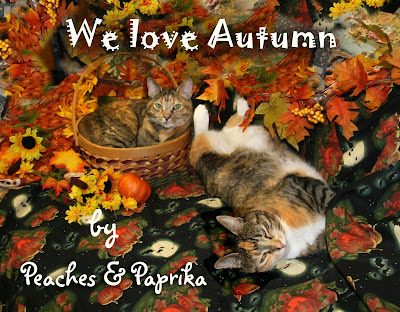 You ladies look just stunning on your autumn print...it's our favorite time of the year too! You are both beautiful. I want to rub that tummy. I learned a lot about both of you today from your Mom, it was nice to meet her.